As GPUs, from companies such as NVIDIA and AMD, have gotten ever more powerful over the past few years, they have become able to deliver real-time 3D performance in ways that we once dreamed about. This is true especially in games, where realistic 3D scenes are interactively rendered in real-time during gameplay. Now convincing real time realism has come to the world of animation. Artists can now turn to their GPUs to render scenes as opposed to CPUs, which were traditionally used for animation production. When I was getting started in 3D animation, we used to wonder if there would come a day when we wouldn’t have to wait the excruciatingly long times it took to render the final frames of your animation. That day is dawning as products such as Reallusion’s iClone begin to deliver on that promise by using the GPU for high quality rendering. 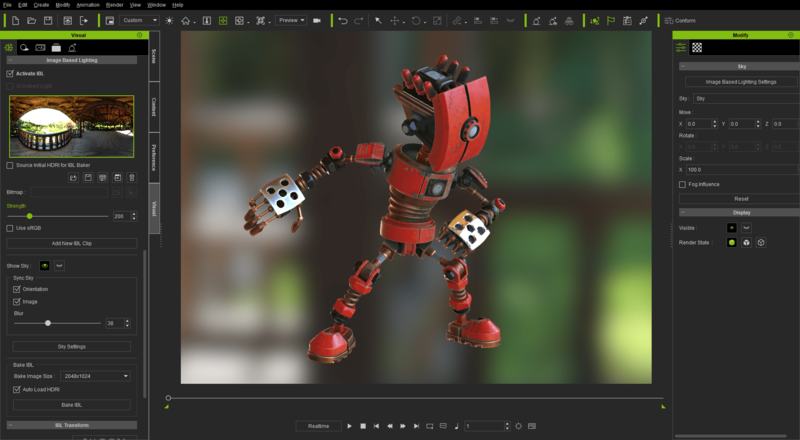 iClone 7 uses the GPU to render images convincingly and realistically. Recently, Reallusion released version 7 of iClone, their flagship real-time 3D animation program that allows you to not only animate entire 3D scenes, but also access libraries and marketplaces of pre-made characters, props, motions, fashions and characters all of which can be modified and morphed in countless ways. iClone 7 is a significant update with impressive new features. It contains major advancements to rendering for enhanced realism, ways to import and export 3D characters, animation and velocity curves, a real camera system and the inclusion of industry standard import and export formats that make iClone more compatible with other leading 3D software and hardware applications such as Cinema 4D, Maya, Mixamo and others. In version 7, Reallusion has re-engineered iClone’s render core to make it more compatible with industry standard shader languages. This has resulted in a new Physically Based Rendering engine (PBR) which can achieve a remarkably realistic look. While true photo-realism may still be best achieved by pre-rendered (non-real-time) renderers, real-time renderers, such as the one found in iClone are starting to get very close, delivering results that can sometimes rival pre-rendered images and in the case of stylized looks, are just as good. iClones PBR rendering allows for enhanced realism and inter-application compatibility. With PBR’s approach to rendering light as it naturally behaves in the physical world, not only will your images look more realistic, but since PBR is a new material content standard, your materials will be consistent between iClone 7, 3D game engines and popular texture applications such as Substance Painter. With the new PBR rendering in iClone 7, many might find the quality sufficient for use in final projects such as independent films, shorts, commercials or Machinima-type of animations. In any case, it is certainly more than enough quality for feature film previsualization projects, an area in which iClone shines. In fact, Previsualization, the art of visualizing sequences of a movie well before film crews, actors, vehicles, stunt men and actors are assembled on location for a shoot, is an area that has a long history in feature film production, and is a great use for iClone 7. It is especially useful for complex chase sequences, Sci-Fi scenes replete with spaceships, or action-packed combat scenes and can save you thousands of dollars by allowing filmmakers to test out various approaches to a shot for pretty much next to nothing.. If you are involved with previsualization (or Pre-Viz as it is also known) for television or film, you’ll definitely want to download iClone and check it out, especially now that iClone 7 includes a new camera system based on popular production cameras used throughout the industry by manufacturers such as RED, Alexa and Canon. Speaking of iClone and Previsualization for motion pictures, Reallusion iClone was the previz and mocap solution used in the upcoming feature film, Replicas, starring Keanu Reeves. The practical stunts techviz and mocap for the robot featured in the film was done on location with Lotus Entertainment in Puerto Rico and was engineered by James Martin of Mobacap (and also professor at Georgia State University) and John Martin II from Reallusion who worked with the VFX crew and executive producer, James Dodson and director, Jeffrey Nachmanoff from preproduction to postviz. 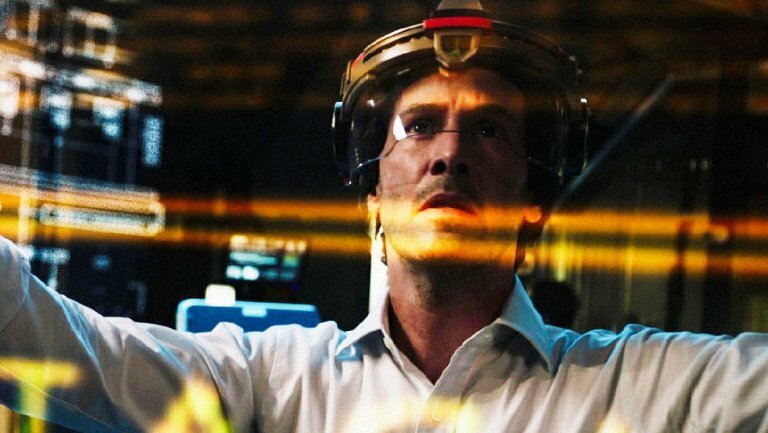 A still from Replicas with Keanu Reeves. The Martin Brothers credit iClone with constant collaboration between producers and crew due to the realtime capabilities that enabled the director and producers to quickly review shots of stunt previz and make informed decisions about the sequence before the big budget stunt shoot. In post, the director and producers were able to view and direct new CG shots with James Martin remotely adding additional mocap sequences or tweaking on-location mocap before the film’s completion. Replicas is due to release in theaters in early 2018. The trailer for Replicas, which debuted at NY’s Comic Con, can be seen here. Reallusion’s iClone 7 is a great tool for Pre-Viz and includes HDRIs for Image based Lighting. Reallusion’s iClone 7 now also includes Global Illumination, powered by NVIDIA VXGI technology (Voxel Cone Tracing). In the real world, light bounces around in a scene, thus things that are not directly illuminated by a light can be indirectly lit by it. With Global Illumination, visual realism is greatly enhanced by integrating the secondary lighting and it’s super fast in iClone 7 since it is based upon NVIDIA GPU rendering technology. Other interesting rendering enhancements in iClone 7, thanks to its new rendering core, is the ability to add your own custom LUTs, to the image including different film looks, as well as the ability to turn any mesh into a shadow capture for later compositing and Temporal Anti-Aliasing. Rendering aficionados will also appreciate the addition of Ambient Occlusion. 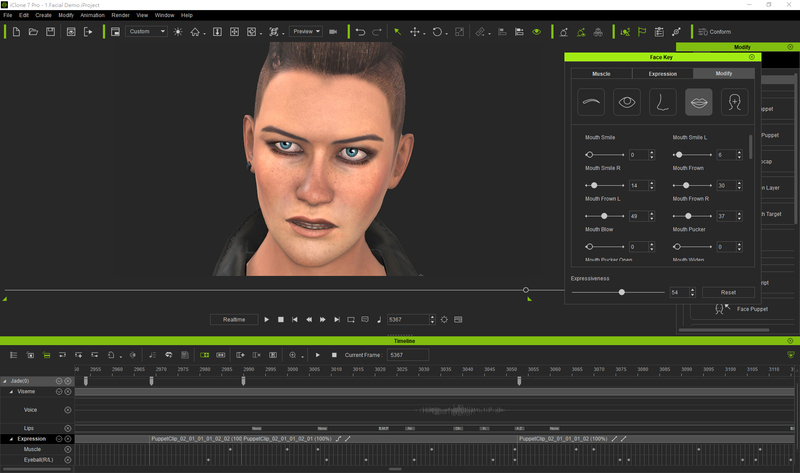 On the character side, iClone 7 includes design tools with a workflow that includes animation-ready rigged characters complete with motion, facial animation and lip-sync built right in. Need to customize your characters? No problem, you can generate unlimited character styles out of the base characters with face and body morphs and even create your own morphs with the new Morph Creator. When you’re done, you can dress your characters with fashion layers. There’s even a physics simulator including soft cloth simulations which are great for clothes such as flowing skirts. 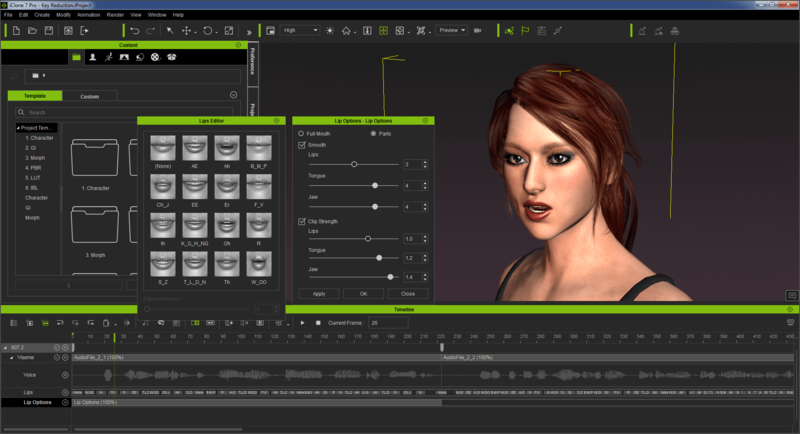 iClone 7 includes extensive facial controls for animation, expressions and lipsync. Speaking of character animation, you can create expressive facial animations with automatic audio lip syncing as well as puppet toots and motion key editing. In iClone 7, the amount of facial morphs has doubled to 60 morphs from 30, giving animators a tremendous amount of control over mouth, cheek, eye and other facial animation. In addition, iClone 7’s facial animation system meets professional face tracking specifications for facial mocap. In iClone 7, you can record face and body animation with a puppeteering engine that allows you to capture animation in real-time. Or if you prefer, you can control individual body parts with HumanIK and use motion layer editing to keyframe your character’s movements. Seasoned animators will be happy to know that the software now contains motion and velocity curves and a fully featured graph editor. 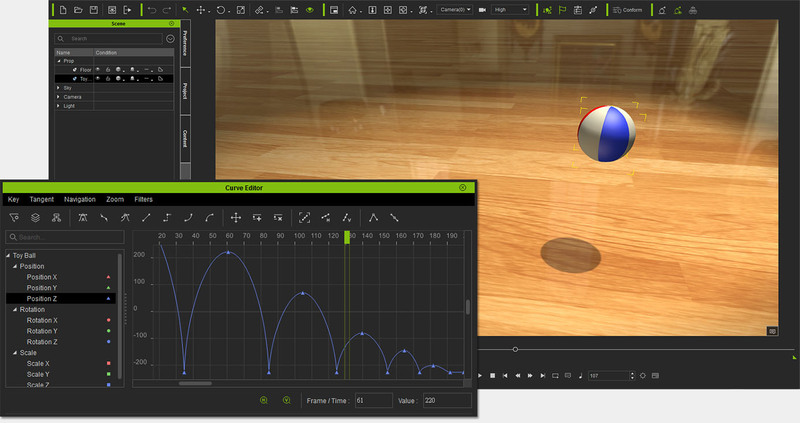 Animation pros will enjoy the fully featured motion curve editor in iClone 7. In addition, Motion capture pros will appreciate the ability to create animation in iClone 7 with Live Mocap, a total body motion capture solution that’s built into the program. There is also a character pipeline for Unity and Unreal for those creating animations for those popular game engines. Aside from mocap, iClone 7 allows you to animate characters manually with Human IK. Reallusion’s iClone 7 is a unique and multi-faceted application that allows you to quickly get started in character animation without having to worry too much about modeling your characters or props from scratch thanks to its extensive libraries and advanced character morphing abilities. 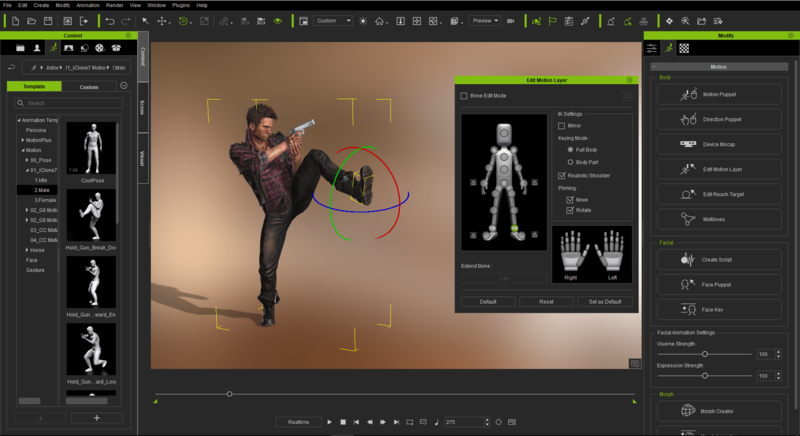 In addition iClone 7 makes it easy to apply motion capture files to your characters as well as add animation by hand via motion layers and motion curves. 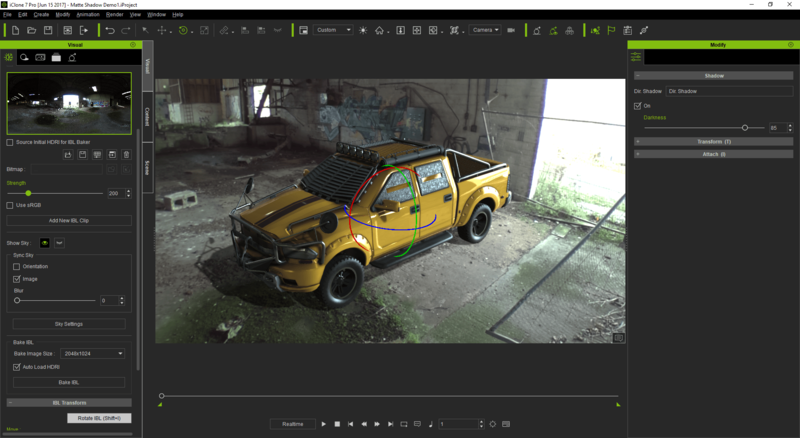 Directors and filmmakers will find iClone 7 to be a great pre-visualization tool, especially with the new real camera system while artists and animators will appreciate the advanced new PBR rendering engine with advanced features such as Global Illumination and Horizon Based Ambient Occlusion. For the latest prices of iClone and find out about the other products available in their pipeline, or to download a thirty day trial of the software, visit Reallusion’s website here.